Situated at the foothills of Zabarwan Range, and overlooking the Dal Lake, the tulips are a sight to behold. One of the best seasons to visit Kashmir is when the tulips are in full bloom. This happens in April or May each year in Kashmir; when these one-of-a-kind tulip gardens come alive in a riot of colours. Tucked in the hills of Zabarwan Range, the Indira Gandhi Memorial Tulip Garden is where you must head for the stunning view of the flowers. 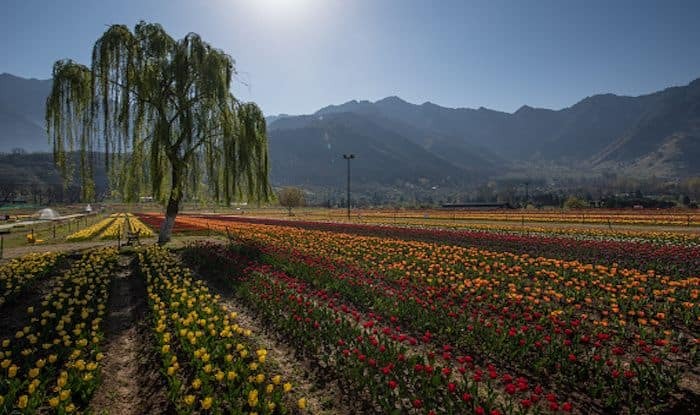 Being the largest tulip garden of Asia, spread across 30 hectares of land, Indira Gandhi Memorial Tulip Garden celebrates the blooming of flowers with Kashmir Tulip Festival each year during spring. You can get a perfect view of the famous Dal Lake from the terrace garden, in addition to almost 60 variety of tulips. The varieties to watch out for are: parrot tulip, double blooms, bi-colour standard tulip, fringed tulip, lily-flowering tulip, standard tulip triumph and single late tulip. The Tulip Festival lasts for about 15 days, the serenity and quietude of the place almost magical. There are about 2 million tulip bulbs strewn across the garden, and the sheer beauty of this place is enough to attract thousands of visitors each year. What started in 2007 as an experiment, has now gone on to become one of the biggest festivals that people look forward to in Kashmir. Other highlights of the festival are the folk song and dance performances as well as kiosks selling local, Kashmiri delicacies. If you’re a nature enthusiast, don’t miss out on a few other beautiful gardens in the vicinity. Chashme Shahi is a major attraction for housing a bubbling spring; Mughal Garden is known for its opulent fountains; Shalimar Bagh is a rather embellished garden built by the Mughal Emperor Jahangir and Nishat Garden is home to a delectable variety of rare flowers, fountains, chinar and cypress trees. The nearest airport from here is in Srinagar. You can take a direct cab from the airport to the Indira Gandhi Memorial Tulip Garden as well as the other gardens.